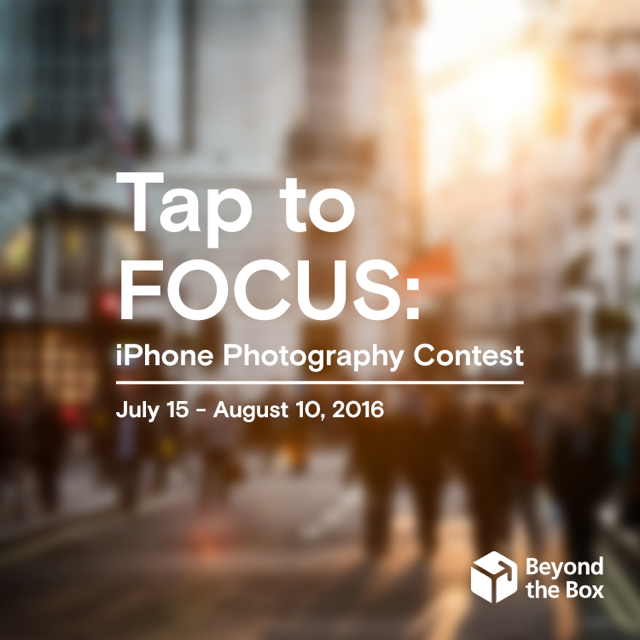 As a brand on a mission to help its customers discover innovative ways of using their everyday devices, Apple Premium Reseller Beyond the Box is launching “Tap to Focus: An iPhone Photography Contest” created to empower photographers to find extraordinary moments in ordinary circumstances. With the belief that photos are the best medium for telling stories, the brand is challenging photographers to capture meaningful photos using only their iPhones. Entries must feature captivating scenes from the streets and submitted photos will be judged by no less than renowned street photography enthusiasts Allan Florendo, Ateneo Sta. Ines, Jasper Tejano, and popular duo Ryan & Garovs Vergara of Everywhere We Shoot. The criteria for judging are as follows: 50% for Creativity, 30% for Originality, and 20% for Relevance to the Theme. Ten of the most outstanding entries will win enviable prizes. The entry with the best photo will win the grand prize of Php 15,000 in cash and one (1) premium item from Beyond the Box. The 2nd place prize is Php 10,000 in cash and one (1) premium item from Beyond the Box. The 3rd place prize is Php 5,000 worth of cash and one (1) premium item from Beyond the Box. The seven (7) remaining entries will win consolation prizes. Plus, winning photographs will be featured in an exhibit at Uptown Mall in Bonifacio Global City alongside the works of the contest judges. To submit entries, participants must LIKE Beyond the Box on Facebook, FOLLOW @beyondtheboxph on Instagram, and send their entries to btbtaptofocus@gmail.com with their name, contact number, title and description of their photo. They must also upload their photographs on both Facebook and Instagram, tag @beyondtheboxph, and use the appropriate hashtags: #BeyondtheBoxPH and #BtBTaptoFocus. There can only be one (1) entry per participant. Participants may start sending their entries on July 15, 2016 and the deadline of submissions is August 10, 2016. Winning entries will be announced on Beyond the Box’s social media accounts on August 15, 2016. Find new ways to inspire creativity through technology at Beyond the Box’s latest store at Level 3, Uptown Place Mall, 36th St. cor. 9th Avenue, Bonifacio Global City, Taguig. For more information on Beyond the Box, you may visit www.beyondthebox.ph, LIKE Beyond the Box on Facebook, and FOLLOW @beyondtheboxph on Instagram.